NAPC 2009 included a large slate of regional field trips that took place before and after the meeting, as well as on Wednesday, June 24, the mid-meeting “break” day. A description of the field trips is provided below. Field trip leaders: Carlton E. Brett, University of Cincinnati, carlton.brett@uc.edu ; Patrick I. McLaughlin, Wisconsin Geological and Natural History Survey, pimclaughlin@wisc.edu ; Susannah Taha McLaughlin, Wisconsin Geological and Natural History Survey; Ben Dattilo, Indiana University—Purdue University Fort Wayne; and Sean Cornell, Shippensburg University (Pennsylvania). This trip provided an overview of spectacular exposures of Upper Ordovician (~455 to 445 million year old) Lexington Limestone and Cincinnati Group (Edenian, Maysvillian, and lower Richmondian). Stops illustrated aspects of taphonomy, sedimentology, and paleoecology of richly fossiliferous mixed shales, siltstones and limestones and their contributions toward a high-resolution sequence stratigraphic framework. Discussions focused on models of shell bed and hardground formation, storm and seismic processes, bioevents and epiboles, taphofacies and paleoecology, including gradient analysis and biotic responses to sea level fluctuations. 2. Changing Physical and Biotic Conditions on Eastern Laurussia: Evidence from Late Devonian-to-Middle Mississippian Basinal and Deltaic Sediments of Northeastern Kentucky, U.S.A.
Field trip leaders: Frank R. Ettensohn, University of Kentucky, f.ettensohn@uky.edu ; Charles E. Mason, Morehead State University, c.mason@moreheadstate.edu ; Thomas R. Lierman, Eastern Kentucky University; Geoff Clayton, Trinity University, Dublin; and D. Brent Wilhelm, University of Kentucky. This trip considered tectonic mechanisms and examined sedimentary and biotic responses in the Upper Devonian and Lower Mississippian Ohio and Sunbury black shales and in the overlying Lower and Middle Mississippian Borden Formation delta complex. Participants examined stratigraphic sequences, observed and collected the ichnofauna and sparse benthic and planktic biota from the black shales, and observed changes in ichno- and benthic faunal development from overlying prodelta, turbiditic, delta-front, and delta-destruction environments. Basinal and prodelta environments are characterized by a largely dysaerobic, micromorph, molluscan fauna with sparse planktic, epiplanktic, and nektic elements. Upper delta-front to delta-platform faunas are characterized by a sparse to prolific megafauna, including echinoderms, bryozoans, brachiopods, and corals. A new discovery, a large glacial dropstone in the black shales was visited, and its implications were discussed as evidence for the first reported tidewater glaciers and alpine glaciation in an ancient orogen. This field trip included stops along the eastern margin of the Illinois Basin (“Western Kentucky and Indiana Coal Fields”) to examine upper Mississippian (Chesterian) to Pennsylvanian exposures in western Kentucky and southern Indiana. The excursion highlighted shallow marine carbonate and tidal-estuarine clastic sequences of the upper Chester, the Mississippian-Pennsylvanian unconformity and a paleovalley in the Caseyville Formation, and thin coals and marine shales in the lower and lower-middle Pennsylvanian. There was an opportunity for marine invertebrate fossil collecting in the Chesterian Menard Formation and a visit to an upper Mississippian fish and tetrapod locality currently under study. This trip began with a visit to one of Cincinnati’s hillside parks for an overview of present day topography, Pleistocene terraces, and the evolution of the Ohio Valley drainage system. The trip continued south of the city into Kentucky, through rolling hills of the dissected Lexington Peneplain, to the valley of Big Bone Creek and Big Bone Lick State Park. Here, in 1739, French soldiers traveling on the Ohio River from Montreal to New Orleans came upon the bones of “gigantic beasts,” now known to have been those of the American Mastodon. Since that time, thousands of fossil bones of both Pleistocene (Wisconsinan) megafauna and Holocene species have been collected at this famous salt lick and grace many of the great museums in the US and Europe. Among the many explorers to visit the site was William Clark, who in 1807 at the behest of Thomas Jefferson, conducted excavations that mark Big Bone Lick as the “Birthplace of American Vertebrate Paleontology.” The trip toured the park and participants discussed its historical, ecological, paleontological and archaeological significance. In the afternoon, participants visited the “Ice Age Trail” in the Museum of Natural History & Science at Cincinnati Museum Center (Union Terminal) to examine “immersion environment” reconstructions of Big Bone Lick and the Cincinnati area as it is thought to have looked approximately 19,000 years ago. Field trip leaders: Steven Holland,University of Georgia, stratum@uga.edu ; and Mark Patzkowsky,Pennsylvania State University, mep12@psu.edu. This field trip examined fossil assemblages before and during the Richmondian Invasion in type-Cincinnatian strata of southwestern Ohio and southeastern Indiana. The excursion highlighted changes in ecological gradients and diversity structure of shallow marine benthic ecosystems during the transition from nutrient-rich cool-water carbonates to nutrient-poor warm-water carbonates. There will be ample opportunities to collect from a wide array of depositional environments in these richly fossiliferous rocks. Exposures of Middle Silurian and Middle Devonian strata were examined in three sites in Clark Co., Indiana. The renowned Falls of the Ohio State Park fossil beds of Devonian age were visited. A tour of the park Interpretive Center and walking on the fossil beds (dependent on the river level) started the day, followed by a visit to the Atkins quarry operated by Heidelberg – Hanson Indiana and the Essroc Italcementi Group quarry. Exposures ranging from the Waldron Shale to the basal New Albany Shale were examined. Field trip leaders: Carlton E. Brett, University of Cincinnati, carlton.brett@uc.edu; Patrick I. McLaughlin, Wisconsin Geological and Natural History Survey, pimclaughlin@wisc.edu . This trip provided an overview of the stratigraphy and paleontology of Upper Ordovician to Devonian successions along the western flank of the Cincinnati Arch near Louisville, Kentucky. It examined major depositional sequences and their diverse faunas; discussions focused on the relationship of sequence stratigraphy, depositional environments, biostratigraphy and paleoecology. It provided an opportunity to collect diverse faunas and examine the record of siliciclastics and carbonate depositional environments in the interior platform of Laurentia. Quarry, river bed, and roadcut sections examined are among the most fossiliferous and well exposed in the North American mid-continent. Sections visited included the famed Falls of the Ohio (Middle Devonian coral beds) Jeffersonville, Indiana, Sellersburg Quarry, Sellersburg, Indiana (mid Silurian carbonates and richly fossiliferous Waldron Shale, Silurian-Devonian “Louisville” unconformity; Middle Devonian coral beds and fossil rich carbonates, and New Albany black shale). The trip also examined a series of excellent roadcut sections in Ordovician to Devonian age in the vicinity of Louisville, KY. This walking/driving tour of Cincinnati featured stones and other materials found on the insides and outsides of historic Cincinnati buildings as well as other structures. The trip investigated the mineral- and fossil-content of building stones and their geological and architectural settings. Highlights included examinations of the limestone and sandstone used for the Roebling Suspension Bridge (the first permanent bridge across the Ohio River), pelagic Italian limestones replete with ammonites in the Cincinnati’s Union Terminal, and fossiliferous stone (containing ichnofossils, and, yes!, “chain corals”) used in St. Peter in Chains Cathedral, built in 1845. Field trip leaders: Alexander J. Bartholomew, SUNY New Paltz, barthola@newpaltz.edu; Carlton E. Brett, University of Cincinnati, carlton.brett@uc.edu; Gordon C. Baird, University of Rochester; Michael K. DeSantis, University of Cincinnati. In association with the Subcommission on Devonian Stratigraphy meeting taking place at NAPC, a post-meeting field excursion was held to examine the Devonian strata of Kentucky, Ohio, and Michigan. The trip focused on Middle and Upper Devonian sequence stratigraphy, emphasizing sea-level, climatic, and biotic events. Richly fossiliferous sections were examined as well as sections of key unconformities, flooding surfaces. Stops included overviews of stratigraphy and paleontology and featured an array of facies and event beds including rhythmic black shales, concretion horizon, mixed carbonate and siliciclastic successions, carbonate biostromes and bioherms, as well as seismites deposits. The first portion of the trip emphasized Middle Devonian (Givetian) Boyle Limestone and Portwood sections along the eastern flank of the Cincinnati Arch in central Kentucky. 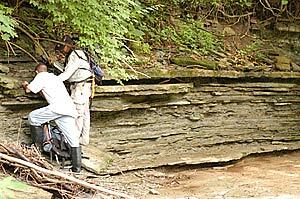 The trip also examined key Upper Devonian sections along the AA Highway including spectacular successions of Ohio Shale and deformed Berea Sandstone. The second part of the trip took a transect northward through central Ohio and focused on richly fossiliferous Eifelian Columbus and Delaware formations as well as the famed fossil bearing Silica Shale in northern Ohio. The third to fifth days of the trip examined the exceptionally fossiliferous limestones (including patch reefs) and shales of the Eifelian Rogers City Formation and Givetian Traverse Group in the vicinity of Alpena, Michigan adjacent to Lake Huron. Finally, the trip return to northern Ohio to examine Middle to Uppermost Devonian sections south of Lake Erie near Sandusky and Cleveland, Ohio. Field trip leaders: David L. Meyer, University of Cincinnati, david.meyer@uc.edu ; and William I. Ausich, Ohio State University, ausich.1@osu.edu . This field trip examined exposures of the Ft. Payne Formation (L. Mississippian, Osagean) along the shores of Lake Cumberland, which include carbonate buildups that have been likened to Waulsortian mounds known from several regions around the world. These exposures are rich in pelmatozoan echinoderms as well as other invertebrates such as brachiopods, bryozoans, corals, and mollusks. Participants had opportunities to collect some of the largest crinoid stems to be found, as well as calyces, and to examine taphonomic and paleoecologic relationships among carbonate buildups and associated carbonate and clastic facies of the Ft. Payne. On the second day, the trip visited exposures of U. Mississippian (Chesterian) clastics in the vicinity of Berea, Kentucky, where participants collected from faunas rich in crinoids, blastoids, brachiopods, bryozoans, and other invertebrates.